Why on Earth does AKC encompass so many different looking dogs? Why can't we have one hound, or one herding dog? Why do we need the towering Irish Wolfhound, the squat long Dachshund, and the slight, sleek Saluki? Why does the Bloodhound have such long droopy ears and why, is the Basset Hound slung so low? requirements of a job shape the individual that is brought in to do the job. Mankind needed a dog to hunt down wolves. The larger Wolfhound was born. The Dachshund was bred be small enough to worm down a badger hole, and feisty enough to dispatch what he found. The Saluki was bred to run down antelope, and swifter game than the Wolfhound, so his body is slighter and leaner. The Bloodhound's ears cup scent to his nose for evaluation. The Basset Hound is low slung and slower for ''walk behind'' hunters, not horsemen. Each of the AKC breeds was designed to fulfill a specific job, different from any other breed. Breed Standards were not developed to make foo-foo show dogs. Breed standards are blueprints to make ideal performance dogs. The German Shepherd Dog Standard is a blueprint to make a premier sheepdog and overall performance dog. Understanding the job of the original German Shepherd sheepdogs will give you a much better insight into the Standard. Tending style dogs were developed to help move large flocks to marginal, fallow, or "useless" lands. Sheep would be moved along the sides of the road eating the verge, to plots that were lying fallow for the year, areas too rocky, hilly, or otherwise unusable for tilling or habitation. This set up a win-win situation for everyone. The grass got cut. The fallow fields received high quality fertilizer, and the sheep farmer has lower/no feed costs. The dogs were required to move anywhere from 20-200-1000 head of big, non-reactive sheep. The Shepherd and his dog would move the sheep thru the countryside all day long. the dogs needed to both work independently AND be able to follow exact commands. In the process of protecting active producing fields, a dog would need to move 5 miles for every mile the sheep moved. Herding style sheepdogs have the same requirements with one exception: the dogs need to have more lateral capability. A tending dog goes up and down the sides of fields guarding the crops within. A herding dog has to be able to follow the movement of livestock; he has to be able to play "cutting horse" if need be. A herding dog may be required to push sheep up into a trailer, fight with a testosterone challenged ram, or move a panicky lamb and his canicidal mother. This requires more lateral movement than patrolling a field border. The Breed Standard gives us a blueprint to make such a dog. 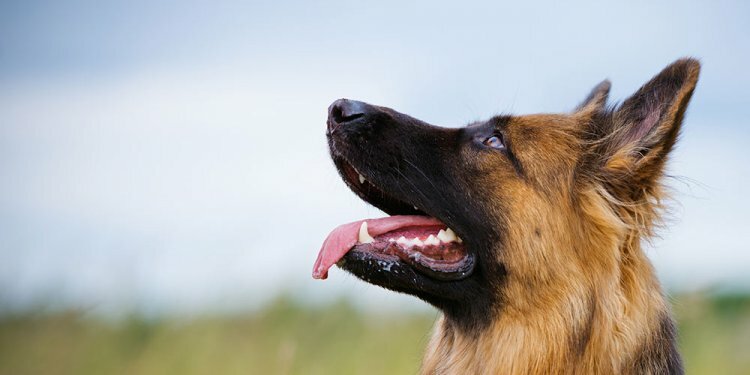 It starts out by giving a brief description of the breed's history and purpose and then gets right down to work by starting with the basic frame of our ideal GSD. These proportions are the key to the success of the German Shepherd. Making the dog roughly 2' tall, gives him the size and basic mass to get most jobs done. the dog is big enough to keep up with sheep as they move, and big enough to discipline them if needed. The smaller herding breeds were bred for different jobs. They simply don't have the leg length needed to keep up with sheep for long periods of time, or the body mass to fight with them. Dogs that are bigger than 2' tall have major problems. They lack flexibility, are clumsy and injury prone in a fight, and expend too much energy/calories simply moving their own body mass around. Bodies that are longer than tall give up a little lateral flexibility for stamina. The longer than tall ratio also gives the body more frame to pack on muscle. The Standard is quite specific. The length is to be made of a harmonious, equal set of thirds, forequarter, back and loin, and rear quarter. Too long drastically reduces lateral flexibility, and creates spinal instability. The leg to body ratio balances the amount of distance that a dog can ideally cover versus his center of gravity.